last week, i did a few furniture makeovers for a client (one was the mirror i already showed here), and i wanted to share a few more with you. 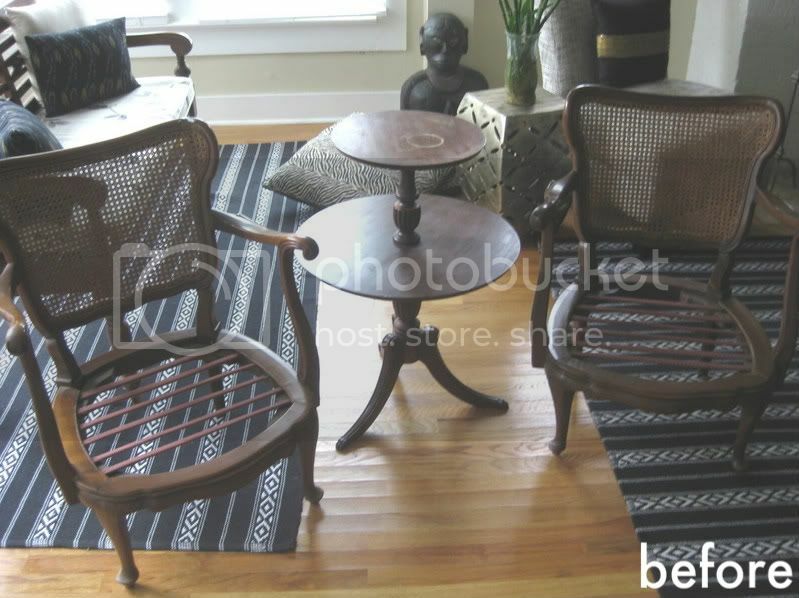 walt found these wonderful wooden chairs at a yard sale, and envisioned them painted a glossy black with new upholstery. don't you love the new combo? so chic, but done in a thrifty way. he found the fabric at forsyth fabrics, here in atlanta. and here is the little table - newly painted a glossy burnt orange. it was raining, so my photos are kind of dark and hard to see, but hopefully you can kind of see how i did the little metal feet in a high-gloss black as well. this was walt's (client) idea, and i thought it was great. those little feet that are on antique furniture deserve to stand out. Awww that table is so cute and I love the color! Good job! Those came out so beautiful! 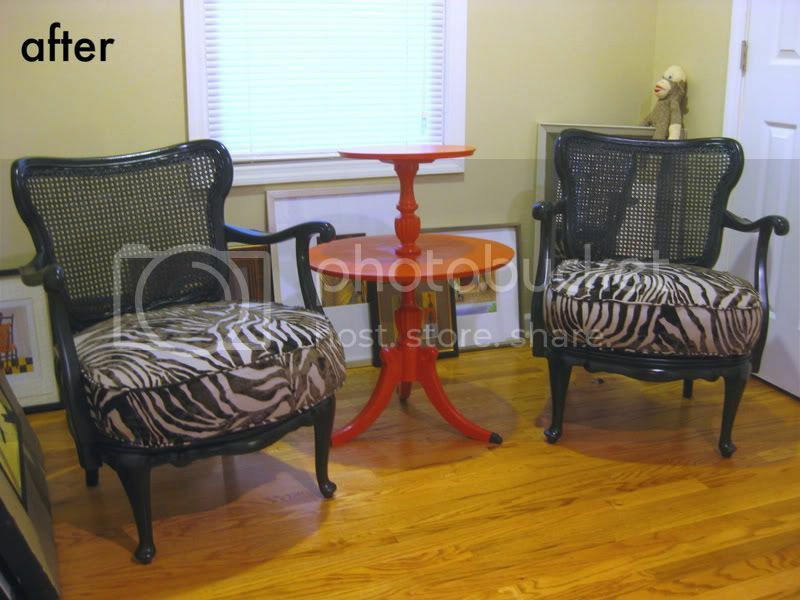 I looooove the orange table and it makes such a nice pop with the black chairs. Great job! I loooooove those chairs. I want them. I need to yard sale more. I love love love them! 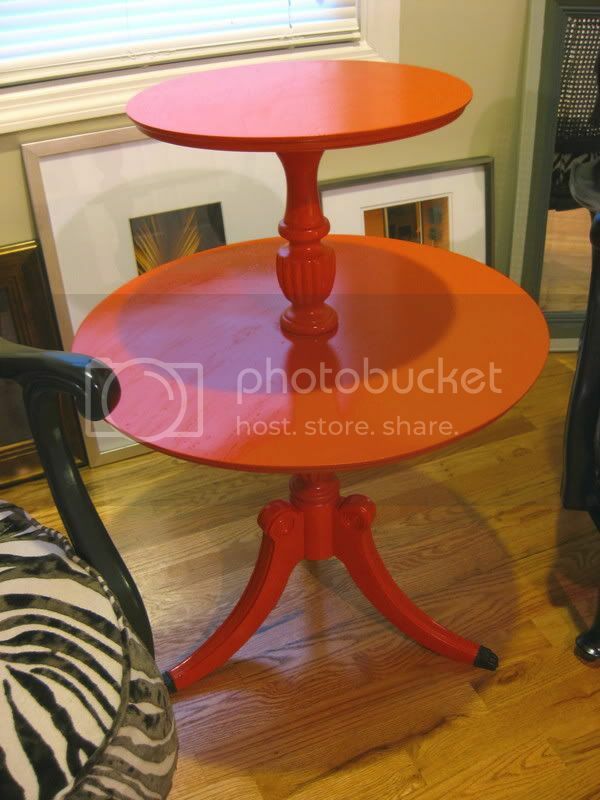 The orange table is so cute and the black feet are just the right detail. The chairs look great!! 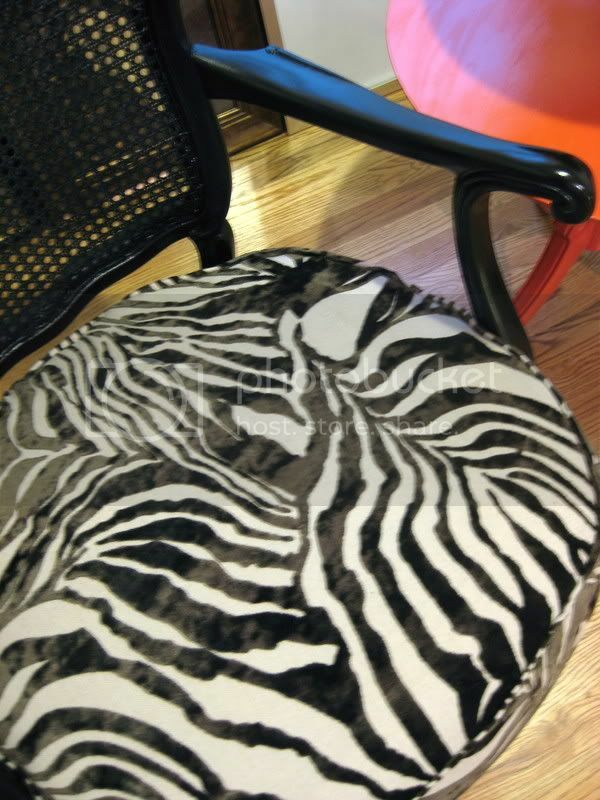 What is the cushion filled with? Foam? Feathers? I love the chairs! They look so good with a thick cushion like that! LifeBegins@Thirty- not sure! i know he had them reupholstered....i'm sure it's foam. A- i know, me too. i just don't like yardsales! they always seem like a bust to me, but other people find so much stuff! The black toes/feet are my favorite. Go Walt! The chairs look like a million (and a half) bucks. I am not a yard sale person but when I was driving in my neighborhood and saw the chairs ... I had to have them. Kristen did an amazing job on the chairs and the table. The table was a $5.00 find. Kristen made my vision, for both pieces, come true. Very chic and modern, thanks to Kristen. FYI...the cushions are foam but have springs in them. Love the chairs and table. Kristen, you do such great work. I really admire your work and secretly wish I had your job! you guys are toooooo kind. you make my day when you say nice stuff about my work! thank you!! Hats off Kirsten, Your work is truly beautiful, appreciate your effort in making two tier table. very nice choice of color..